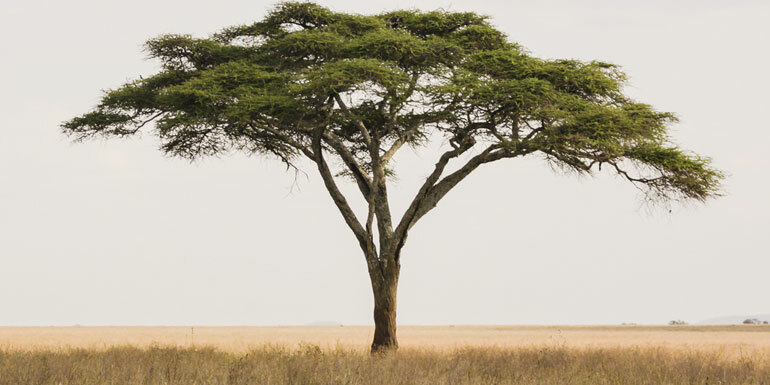 The Paper-Barked Thorn (Acacia Sieberiana) is a semi-deciduous to deciduous tree up to 18m tall with a large and spread flat crown. The Paper-Barked Thorn tree is a good shade tree. Plant in groups of 10-20 in camps where shade is required. 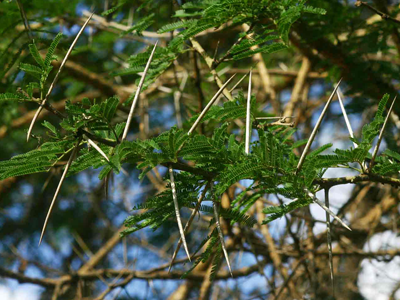 Leaves are thorn-like and support in pairs, white and 25-100mm in length. Pairs of leaves ending in a small, short torn visible on the lower surface. Young leaves covered in thick yellow hair. Flowers are fragrant wearing cream colored balls in groups in the leaf axils. The green pods and wilted leaves contain large amounts of prussic acid and can poison animals. Poisoning usually occurs when animals eat pots that were blown off by the wind or hail. Leaves and pods can have a taste of milk if eaten in large quantities only when animals was milked. The leaves are eaten by giraffes. The bark is smooth and gray in young branches, but darker on older branches. stems scaling later into parts, leaving dark brown spots behind. The bark is light brown to yellowish and corky, track into a large flat pieces. Young branches are covered with dense, long yellow hair. The wood is soft and easily destroyed by wood borers, unless in water for at least 24-30 weeks held and then boards are cut. This wood can easily been used as timber wood on the farm. The glue from wounds on the stem is edible. An infusion of the roots is used as an antiseptic detergent. A decoction of the bark is used as a pain reliever. 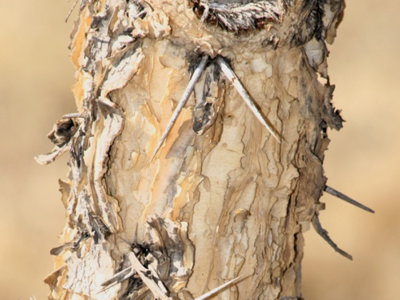 Paper-Barked Thorn trees occurs in grasslands, wooded grassland and woodlands along drainage lines and floodplains. It prefers loamy soil but grows well in sandy soil. Cattle and wildlife eat the pods and it is an important feeding tree. To grow your own tree the seeds should be soaked overnight in warm water to soften the hard seed coat. Sow in crates filled with washed river sand. Cover with soil, keep the growing medium moist and place in a warm place. Seed will germinate within 10-25 days or so. Paper-barked thorn trees are fast-growers but young plants must be protected from cold winds and frost.